Grab this 500-round “brick” of .22LR Federal rimfire for a fun day of plinking or target shooting. Ideal for high volume shooting as well as introducing people new to guns how to shoot accurately and safely. 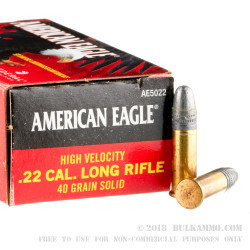 A high velocity round with a muzzle velocity of 1240 feet per second, Federal American Eagle uses a standard 40-grain lead round nose bullet. Each brick holds 10 boxes with 50 rounds each. It will function in all rimfire rifles and pistols chambered in .22 Long Rifle. Since its founding in 1922, Federal Premium Ammunition has manufactured high quality rimfire and centerfire ammunition at its facility in Anoka, Minnesota. 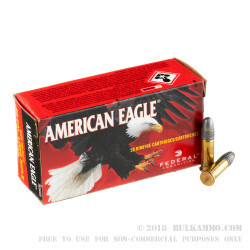 Federal enjoys a strong reputation for quality as the maker of well-known self defense rounds such as Hydra-Shok and a variety of affordable but accurate rimfire rounds. The company also produces mil-spec ammunition for the military and civilian markets at Lake City, a government arsenal in Missouri. GREAT PRICES ---- FAST SHIPPING --- CORDIAL AND FAST SHIPPING! NO WAY WILL I PURCHASE ELSEWHERE! VALUE = 100% ----- HELP ON 'PHONE' SUPERB ----- NO ISSUE WITH PROBLEM I CREATED MYSELF (YES -- I AM "OLD AND FORGETFUL DELUXE"! Reliable? Ammo Performance = SHOOT AS MANUFACTURER CLAIMS! GOOD STUFF MAYNARD! I put 100 rounds through a brand new Henry lever action. I had 5 FTFs. With this being Federal ammo and paying a somewhat premium price, I expected better. Maybe it was just the one box, maybe its the gun. To be fair, I will write another review after I fire the entire 1000 rounds that I purchased. 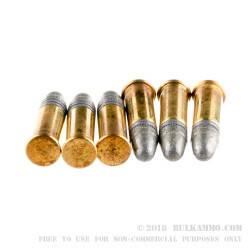 Great service and great ammo. Does not work well with sig 938 - 22. Cycled perfectly through my Colt M4/.22 cal LR semi-auto rifle. Sighted my Walther CQB scope at 25 yards with a group covered by a quarter. No problems cycling the rifle as a high velocity .22 round. Buy with confidence. Only drawback to me is that the lead bullets are just that - 100% lead. Other than that, perfect. It's Federal, made in the USA.. what's not to like?